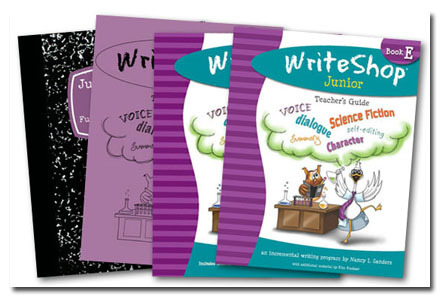 We reviewed WriteShop Junior: Book E Set by WriteShop. Writing is my thing. I just get it and on top of that, I love to write. 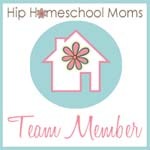 Whether you are a homeschool teacher or one who teaches students outside of the home, you will probably only find in your lifetime a handful of students who love to write. I think that is okay, but I would prefer it were because they had interest elsewhere as opposed to not understanding the craft. Writing is fun. I tell you the truth. I understand writing isn’t for everyone and I think WriteShop understands that too. They have created a line of writing curriculum that engages the child in the craft of writing and presents the material in a manner that could promote a love of the skill. And helped parents know how to methodically evaluate their children’s writing. 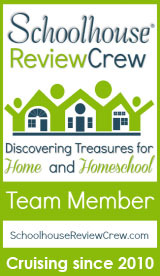 As resourceful as many homeschoolers are, they decided to create their own curriculum. It combined all of the above listed needs and became what we now know as WriteShop, which has been helping students write for almost 15 years. 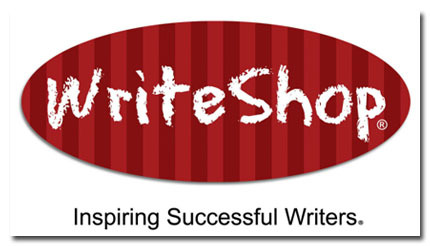 WriteShop is an incremental writing program. The lessons build upon each other and continually include previously taught material to reinforce what the student is being taught. Even though it is incremental, it isn’t necessary that your child begin in Book A to benefit from the curriculum. You are able to jump right in and start from where your child is in his writing journey. We had the opportunity to review a physical copy of the WriteShop Junior Book E Teacher’s Guide and WriteShop Junior Book E Time-Saver Pack and digital copies of WriteShop Junior Book E Writer’s Notebook: Fun with Story Planning and WriteShop Junior Fold-N-Go Grammar Pack E-book Level 2 The Book E set is designed for fourth and fifth grade students, but may also be used for teaching reluctant sixth and seventh graders who have had limited writing experience. The WriteShop series has writing books that cover grades kindergarten through high school and they believe in teaching the skill (and art) of writing early. If you are not sure where to start your child, then they have a chart that can help you determine where your student would begin when using the series. If you need more assistance, then Ms. Kautzer goes into more detail here. There is no student book, only a teacher’s guide, which provides schedule suggestions (three-week, two-week, or one-week lesson plans) and suggestions on teaching multiple children at different levels. There are 10 lessons in the book, so you can decide which schedule to follow depending upon how quickly you want to move through the book. Everything for instruction is provided in the teacher’s guide from guided instruction to sample dialogue to lesson prep. If you are a planner, then you will love the detail provided to help you prepare for each lesson (see a sample lesson). The activity sheets and Fold-N-Go and Junior Writer’s Notebook pages are reproducible for use by your family. 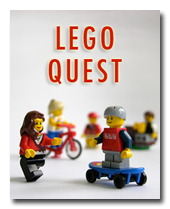 They complete the program and introduce and support what the student is taught in each lesson. Before starting, it is suggested that you create a writing center with supplies/tools that will inspire your student and enhance his writing experience. I like the idea of a writing/supply area, but this time around, we didn’t create one as suggested, because we have our own writing system in place. The student is introduced to beginning writing skills and provided the tools he needs to be successful at writing. They will go through the brainstorming process of collecting their ideas. They learn about the ingredient of a story, which includes: Who? – characters; What? – problem; When? – setting (time); Where? setting (place); and Why? or How? – solution. Then, the student will put everything together and have a well developed story with all of the details from the beginning to the end. The student is given a variety of activities that are fun and engaging to motivate his interest in writing. Hopefully, what he learns will encourage him while he develops his writing skills. 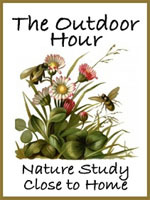 We have been homeschooling now a little over four years. During that time, writing has been a part of it since River was as young as the first grade. Most of the writing they did was short paragraphs. I wanted to get them use to opening their minds and letting their thoughts flow onto the paper; no limitations, but there was not much structure. They learned a lot, but I saw the need for more structure, direction, and for them to have a reason and an understanding for the steps in the writing process. We followed the three-week lesson plan. You really do need to read through the teacher’s guide, otherwise, you will be lost. The approach that WriteShop takes, providing writing prompts and not forcing the student to figure it out on his own is wonderful. I know the concept of writing prompts isn’t new, but I think that is where a lot of children acquire their dislike of writing. Sometimes, topics and ideas just don’t pop into your head. Some of the themes River was introduced to were writing fables, humor, science fiction and his favorite, mystery. Those gave him insight into writing different genres and also that writing isn’t associated with only writing book reports, term papers, etc., which I don’t even enjoy writing. The Fold-N-Go was very helpful and useful for him to have as a reference. The Writer’ Notebook is great for teaching a student the process and steps one should take from the beginning of the writing process to the finished product. If you’re wanting to interest a student to write, then the Notebook is a wonderful resource to include in his writing program. I don’t think that he will become the next Frank Peretti, but he was more apt to sitting down at the table and putting words to go with some of the drawings that he does. We did not really get into many of the hands-on activities only because they are geared more towards the younger age of student for which Book E targets (fourth or fifth grades). I think the hands-on approach would be great for a reluctant writer, who would be able to see some of his writings come together through projects. I really like WriteShop. I like that they have curriculum for teaching writing as early as kindergarten and that the lessons are not intimidating for the student (nor is the instruction for the teacher). The incremental approach gives the student an opportunity to gradually walk through the process of putting his thoughts on paper and making it presentable and understandable for others to read and enjoy. The guided teacher’s manual is helpful for the instructor whether or not he or she has experience writing. You don’t have to love writing or be published to be able to teach your student how to write. Everything is in the teacher’s guide. For the experienced writer/teacher, some of the lessons were a good reminder of writing basics, the necessary ingredients, and the thought process to go through when doing any type of writing. Some steps may get overlooked to arrive at my final product. Part of the ingredients, “Who?, Where?, When?, What?, Why and How?,” are so simple, but one or more of those ingredients can sometimes be forgotten in the final writing product. 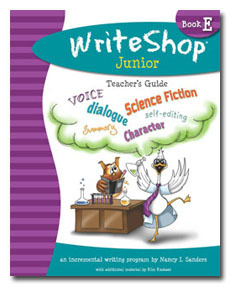 The WriteShop Junior Book E Teacher’s Guide is $45.95. 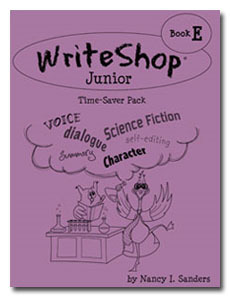 The WriteShop Junior Book E Time-Saver Pack is $14.95. The digital copy of WriteShop Junior Book E Writer’s Notebook: Fun with Story Planning is $3.50. The digital copy of WriteShop Junior Fold-N-Go Grammar Pack E-book Level 2 is $12.50.